The next day, I found out I was indeed awarded this amazing fellowship. I will be spending 3 months in France, drawing and painting architecture every day! My study will take me to the gardens, buildings and interiors at Versailles, Vaux-le-Vicomte and Fontainebleau. I am so honored and grateful, excited beyond words at these opportunities. 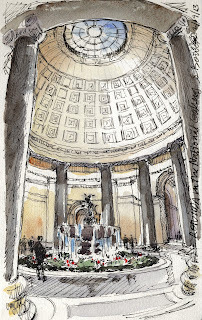 I hope to join the Paris Urban Sketchers. Great news! Congrats, Stephanie, well deserved! Congratulations, Stephanie -- what spectacular news! Well-deserved, indeed! Oh WOW !! Congratulations! Your sketches are OUTSTANDING!!! Thank you so much Gabi (THE MAN), tina and Carleen for the supportive comments. It is much appreciated! Wow! Congratulations! They are beautiful and I'm sure there will be more to come! Wonderful news! Congratulations and I'm looking forward to seeing your sketchbooks on your return. Congratulations Stephanie. I will be living vicariously through your beautiful sketches of Parisian street scenes.